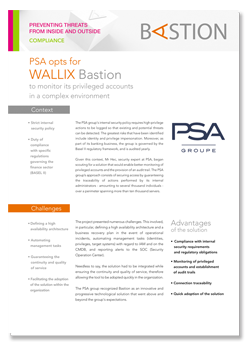 Discover why PSA Group chose the WALLIX Bastion! The PSA Group's internal security policy requires high-privilege actions to be logged so that existing and potential threats can be detected. The greatest risks that have been identified include identity and privilege impersonation. PSA has been a loyal customer of WALLIX for many years. “We continue to deploy the WALLIX Bastion to this day as it has been proven time and again that the solution is reliable, its integration is efficient and it meets all our traceability and automation criteria."